The In-Laws | Teefa Says.. Being married to your cousin is even better. One of the reasons is there's no issue of 'can they accept me as i am?' They know me. We've known each other's family for life. Since my mum and dad passed away, my uncle and aunty (now father and mother in law) has been looking after my brothers and i. We went on trips together. Cooked in the same kitchen. Talk about life. Kenduri kendara segala. Been through crisis. Wear each other's clothes/shoes/slippers. Had misunderstandings. You know, being a family. When Mr. Chenta and i first got together, breaking the news to our family is a huge deal to us. We didn't have the meeting-the-parents jitters (come on, they are practically my parents already!). But we did have the will-they-be-okay-about-us-being-together? drama. 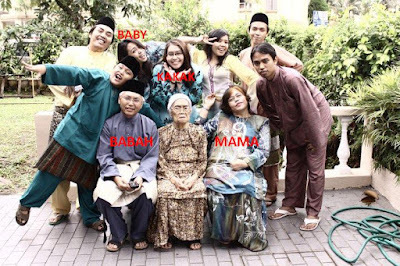 And the will-my-maternal-family ( my grand parents and uncles and aunties on my mum's side) -be-okay-with-us-marrying? drama. Alhamdulillah, to my surprise, everyone was okay with us being together. Some were even pleased. No objection whatsoever. Now that we're married, i keep forgetting that my uncle and aunty are not just Uncle Mael and Acik. They're my parents-in-law. Kakak and Baby are not just my cousins. They are my sisters-in-law. And Adik is my brother-in-law. Mind you, they're practically my family already. But to call your aunt "Mama" after 26 years of calling her "Acik" is a bit awkward. i swear in my heart she's my mama and i really wanna call her mama but everytime i tried, my tongue freezes. It's not that i don't want to. It's harrrdddddd! Wan was like "Apa niii panggil Acik. Mama lah, mama! Dah kawen kene la panggil Mama.." i could die everytime she says that. Bottom line is; subconciously i know that they're my in-laws now. Sometimes i just forget to register that Acik is Mama, Uncle Mael is Babah and Kakak and Baby are my sisters now. Time will heal this mental illness of mine.